Cetaceans (pronounced sih-TAY-shuns) include whales, dolphins, and porpoises. Although ancient people believed they were fish, cetaceans are aquatic mammals that bear live young, produce milk to feed their offspring, and have a bit of hair. The study of cetaceans is called cetology. Although they have a fishlike shape, cetaceans are descended from land animals and still retain some modified features of their ancestors. They have the remains of a pelvic girdle, and the bones beneath their forelimbs, which are now used as flippers for swimming, show that they once had five fingers. Like land animals they have lungs, but instead of nostrils cetaceans breathe air through blowholes on the top of their head. They have no hind legs, and their tail has developed over time into a horizontal fluke (a flat tail), used to propel the animal through the water. Other physical changes include the addition of a thick layer of blubber to insulate against the cold of the ocean depths. Cetaceans belong to the order Cetacea and include the baleen whales (ten species that live in the ocean) and the toothed whales, whose many species (including dolphins and porpoises) are found in diverse habitats from deep ocean to freshwater rivers. Baleen (pronounced buh-LEEN) whales are huge creatures that include the blue whale, the largest animal that has ever lived and that can reach a length of 100 feet (30 meters). Together with the finback, sei, humpback, minke, and gray whales, the blue whale belongs to a family of whales that migrates from cold polar waters to breed in warmer waters. The right whale, so-named because it was the "right one" for whalers, does not have the dorsal fin of the other great whales. Baleen whales are toothless; they eat by filtering tiny sea animals, or plankton, through rows of flexible, horny plates called baleen that hang from their upper jaw. One mouthful of water may contain millions of tiny prey. Baleen whales have two blowholes (toothed whales have only one), and some species have deep grooves on their throat and belly. The faster-moving, smaller-bodied toothed whales pursue squid, fish, and, in the case of killer whales, sea birds and other mammals. Killer whales have even been observed ganging up on and killing the much bigger gray whale. The largest of the toothed whales is the sperm whale. It is also the deepest diver, plunging to depths of over half a mile in search of giant squid. Its large, square head contains a cavity of oil that was used in oil lamps before petroleum became available. Certain species of toothed whales are very social, traveling in groups of dozens of animals. Bottle-nosed dolphins and killer whales typically have social bonds with many others of their species that may last for life. Baleen: A flexible, horny substance making up two rows of plates that hang from the upper jaws of baleen whales. Echolocation: A method of locating objects by the echoes reflected from sounds produced by certain animals. 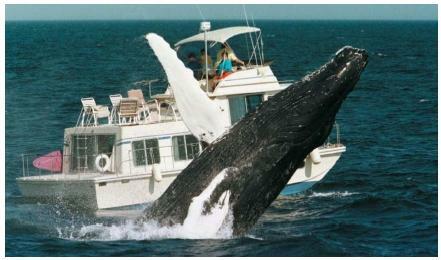 Whaling: The harvesting of whales for their products by individuals or commercial operations. Cetaceans have good vision and excellent hearing. Toothed whales, porpoises, and dolphins navigate and find food using echolocation, in which they produce pulses of sound and listen for the echo. By deciphering objects based on the reflected echoes, these animals can obtain an accurate picture of their physical environment. Cetaceans have relatively large brains and are highly intelligent animals that exhibit curiosity, affection, jealousy, self-control, sympathy, spite, and trick-playing. They communicate with each other by producing a great variety of sounds, from the moans and knocks of gray whales to the eerie songs of humpbacks. may not be immediate, and the whale may struggle to live for 15 minutes of more. Although many nations have agreed to end or curtail their whaling practices, some have not. Further dangers to cetacean species include (1) drift nets (now outlawed), in which they can become entangled, and (2) the use of purseseines (pronounced sane; nets whose ends are pulled together to form a huge ball) for catching tuna, a method that has killed an estimated seven million dolphins since 1959. Marine pollution and the loss of food sources due to human activity are a continuing danger.